The SU-122 is a Rank II Soviet tank destroyer with a battle rating of 2.7 (AB) and 3.0 (RB/SB). It was introduced during the Closed Beta Test for Ground Forces before Update 1.41. This vehicle was created on T-34 chassis. It carries a fearsome 122 mm M-30 howitzer. The main feature of this SPG is a powerful gun, but make good use of the first shot, it might be the last. It is very hard to hit targets from over 500 m in realistic and simulator battles. 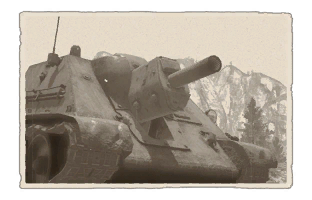 One good tactic would be to rush an enemy tank and shoot him at point blank range but this only works if there is no other enemy tank because with an untrained crew it can take up to 33 seconds before the SU-122 has reloaded. Ammo racks of the SU-122. The success of the Germans StuG III and other self-propelled assault gun took the Soviet High Command's interest on the concept. Self-propelled guns were generally considered cheaper and more easily produced compared to regular tanks due to the lack of turret, plus it could be made with a large fighting compartment and bigger guns than those that could be mounted on turrets, the only drawbacks to the designs were limited traverse of the gun so it would do poorly in close-quarters situations. In April 1942, the Soviets asked design bureaus to begin development of assault guns using a wide selection of armament ranging from their 76.2 mm ZiS-3 field guns, 122 mm M-30, and 152 mm ML-20 howitzers. 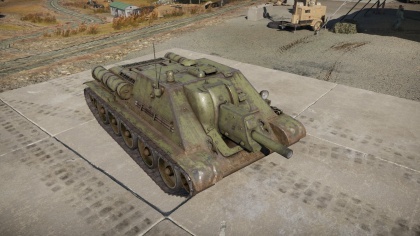 The prototype assault gun was armed with the 122 mm and was quite similar to the StuG III's design, designated the SG-122, of which only 10 were made due to reliability issues. The next step was to take the standard issued Soviet tank, the T-34, and convert that into the assault gun. The prototype, U-34, was created in summer of 1942 in the Uralsky Machine Building factory by N. W. Kurin and G. F. Ksjunin. It initially had the same armament of 76.2 mm, but it was 70 cm lower than the regular T-34 and had more armor at a lighter weight, this did not enter production. Another work was done to combine the U-34 features with the SG-122, this was completed in around late summer of 1942 and featured the U-34 chassis with the 122 mm armament placed on with the least modifications possible to keep the design affordable and easy to produce. This new design, now the U-35, was created in November 25, 1942 and was sent for evaluations. There were faults discovered in the elevation mechanism, loading system, and ventilation for the crew. Despite these flaws, the vehicle was accepted into service first as the SU-35, but then renamed the SU-122. Several modifications were made to the vehicle during production, such as simplifications to the design, modified interior layout, removed vision slots, and added a commander's periscope. The production began on December 1942 and continue on until summer of 1944 with 1,150 total unit produced. The vehicle was based off the T-34 chassis, so it uses the same running gear, engine, suspension, and tracks as the T-34. This is consistent with the concept of utilizing the chassis of proven vehicles and converting them into other uses. The design mounted the 122 mm M-30 howitzer, which was made for infantry support in a role similar to the StuG III in German usage. The M-30S howitzer could be elevated or depressed between −3° and +26° and had 10° of traverse. The design had no armor advantage over the standard T-34 with 45 mm thick frontal armor to keep production simple. The design had a crew of five, the driver, gunner, commander, and two loaders to load the 122 mm shells. The first few SU-122s created were sent to training centers and to two combat units, the 1433rd and 1434th self-propelled artillery regiments. Each regiments were intended to have two batteries of four SU-122s and four batteries of four SU-76s. Thirty of such self-propelled artillery regiments were planned to be raised in the armor and mechanized corps. In January 1943, the 1433 and 1434 regiments were sent to Leningrad near the Volkhov Front to support the 54th Army. These regiments and their self-propelled guns first saw action in January 14 in the Smierdny region. Combat experience showed that the best deployment of the SU-122s were about 400 to 600 meters behind advancing tank units, to which it was sometimes reduced to just 200 meters minimum distance. The mixed deployment of the SU-76 and the SU-122 was a failure and the organization was changed. The new system had two batteries of SU-76 and three batteries of SU-122s for 20 vehicles, this was changed again in April for separate regiments for SU-76s and SU-122s (called "light" and "medium" respectively). The medium self-propelled artillery regiments had four batteries of four SU-122s each for 16 vehicles. An additional SU-122 or T-34 was added as a commander for the regiment, along with a BA-64 armored car for reconnaissance duties. This organization of the self-propelled artillery regiments stayed until the beginning of 1944 as newer and better self-propelled guns such as the SU-85, ISU-122, and ISU-152 were being produced, when the SU-122 was beginning to be phased out as well. The SU-122 in combat proved very effective in its role as a direct fire support on strongholds. 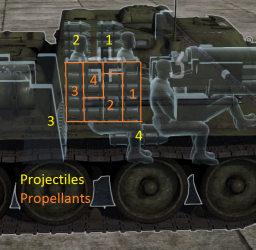 The high-power high-explosive rounds creates a massive concussion blast on impact, and may be powerful enough to even knock the turret off a Tiger I tank. Until May 1943, only the HE rounds were available for the 122 mm gun, but the BP-460A HEAT rounds were introduced on that month that could theoretically penetrate any armor the German have on their tanks, but the HEAT round's primitive design and fuse, adding the gun's inaccuracy, caused the SU-122 to not be an effective tank destroyer. The SU-122 was never mass-produced in variants, but some were made into prototypes. The SU-122M had a larger compartment and newer D-11 gun, and the SU-122-III had an even lighter gun than the D-11, but was unsuccessful due to unreliability. Both of these were cancelled when production priorities went to the SU-85 design. Only a small number of SU-122s survive the war, with only one known example on display at the Kubinka Tank Museum.